Note: This box was sent for review purposes by TokyoTreat – All opinions are my own, I only post high-quality products! While there are plenty of candy and snacks available on the shelves of every grocery outlet and retail store in the United States, none can compare to the delicacies that is Japanese snack food. However, there’s just one problem: Unless you live in Japan or have access to a store that imports these candies, it’s incredibly difficult to get a hold of them. 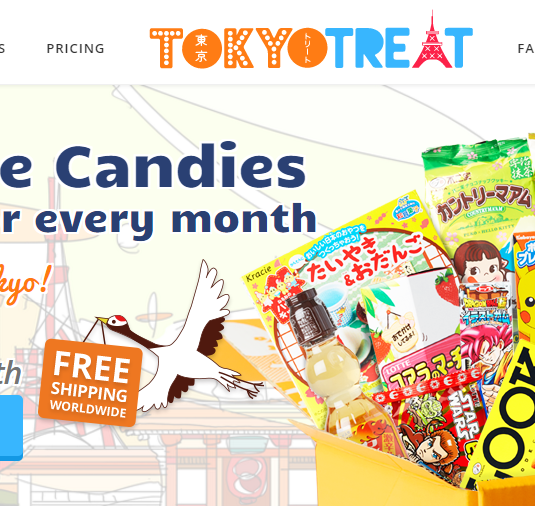 Enter TokyoTreat, a subscription service that puts Japanese candy directly into your mailbox. 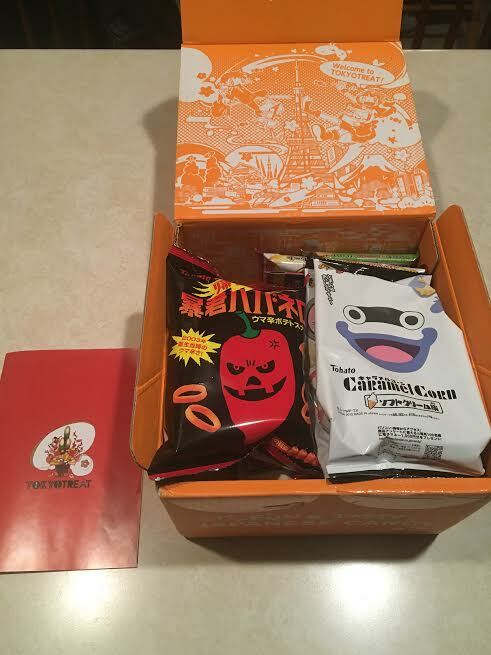 TokyoTreat is a subscription box service with a simple premise: For a small monthly fee, you’ll get a box of random Japanese candy and snacks hand-selected by the TokyoTreat staff. You won’t be getting sample sizes here, as TokyoTreat promises full-size candies and snacks in every box. Based out of Tokyo, Japan, TokyoTreat has access to a wide array of delicious candies and snacks that other subscription services can only dream about. What separates TokyoTreat from its competitors is that it offers different tiers: small, regular and premium. With each new tier comes an increase in price but also an increase in the size of the box you receive as well. While the small box features five to seven pieces of food, the premium box offers a whopping 15 to 17 items along with a special bonus item! If your mouth is salivating at just the thought of a box of Japanese candy and snacks, then TokyoTreat is a must. You won’t want to miss a box of this service, so sign up today–your taste buds will thank you later! 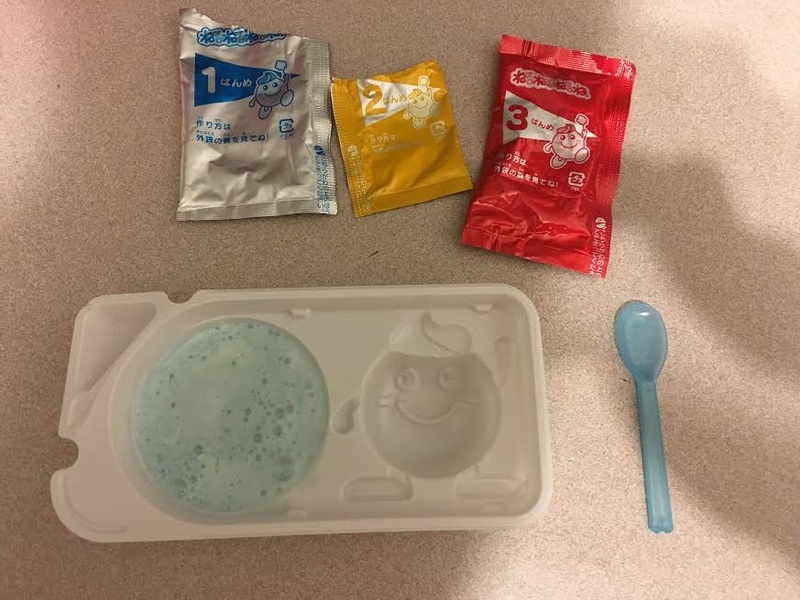 Read on to see what was included in my box! NOTE: Each month the treats change, I just wanted to show what was included in this month. When I first opened this box I did not know what to expect. I was pleasantly surprised when I saw everything neatly packed, with various colorful bags full of treats. However then I started to get nervous as I looked at the packaging. Of course, since this candy is directly from Tokyo almost all of the writing was in Japanese – I don’t know Japanese though! Before I started randomly trying without knowing what I was eating, I noticed a small booklet that was included. I was happy to see that along with pictures of everything that is in the box they also included in English what each treat was, with interesting facts about what you were eating. I was also surprised to see there were more pages devoted to fun cultural facts about Tokyo and surrounding cities. Quite an impressive little booklet. The theme of this box was Pokemon. As mentioned in the introduction TokyoTreat offers three levels. 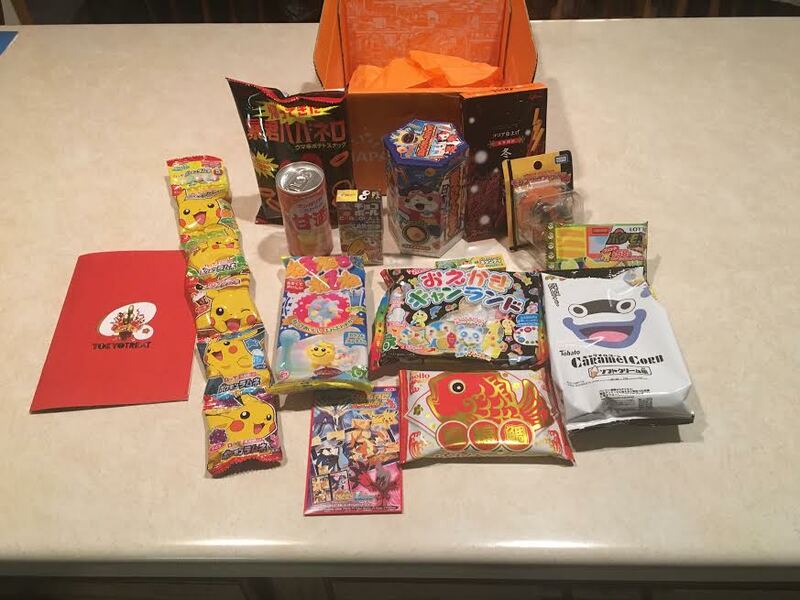 If you would have purchased the “Small” box at $14.99 per month, you would have received Fuku Fuku Tai Chocolate, Pokemon Wafers, Pokemon Ramune, Yokai Watch Ice Cream Caramel Corn, and Tyrant Habanero rings. The Fuku Fuku Tai Chocolate bar was shaped like a fish and was awesome! sort of reminded me of Neapolitan wafers, soft and sweet. The Pokemon wafers were bits of chocolate in a wafer crisp, tasted like a Twix bar. The Ramune was tiny sugary candy pieces in various flavors, a bit like sweet tarts, nice and tasty and some odd flavors! One of the treats I was a bit hesitant about was the Ice Cream flavored caramel corn, but it turned out to be surprisingly tasty and sweet. The habanero rings had quite a menacing package, and rightfully so, they had quite a spice kick. If you would have purchased the “Regular” package, along with the items in the Small box you would also have gotten: Neru Neru Nerune, Winter Pocky, Pokemon Chewing Candy, Pokemon Sticker Chewing Gum, Namaste Curry. The regular box is $24.99 per month. I have never encountered a candy that was quite like the Neru Neru Nerune, check out the picture. It was a DIY candy kit that apparently has been popular in Japan for over 30 years. Included in the packaging are three packets two with a sugar substance, and one with tiny candy pieces. You mix the two sugar packets along with a bit of water in the included bowl and leave it out overnight. The next day it was set up and I gave it a try. 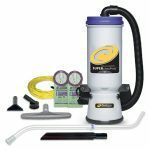 Not quite sure how to explain it, but when set up it tasted like a goopy cotton candy. It was not my favorite item in the box but it was really unique. The Pocky was the first item I tried and it was a great thing to start with, very mild and yet tasty, it was essentially a thin chocolate covered breadstick which also tasted a bit like a Twix bar. The Pokemon Chewing Candy had a hard gum stick taste and look to them. Each piece of candy had a sticker on the wrapper that could be used like a temporary tattoo. The Sticker Matching Gum had a tiny little sticker game included along with a very sweet tasting cola flavored gum. The Namaste Curry was surprisingly tasty. Besides Indian food, I don’t often have food with curry in it, and this savory treat would certainly be something I would buy a bag of as a treat, they had an onion ring type consistency to them. If you purchased the “Premium” box ($34.99 per month) along with all the previous mentioned treats you would have also received: Pokemon Moncolle toy, Amazake Sweet Sake, Oekaki Kyanland Candy, Chocolate Ball Peanut. The chocolate ball peanut was quite tasty though a bit smaller than I expected. It was simple treat of peanuts coated in chocolate. The Pokemon Moncolle was a neat little collectible figurine. I was quite surprised to see a can included in my box and inside was a sweet non-alcoholic sake. The Amazake was pretty good however the bottom of the can seemed to be a hardened sludge of sake, that put me off a bit, not sure if it was supposed to be like that. The Oekaki Kyanland was also a DIY kit that was quite unique. A doughy sweet candy was included that you could press into various animal molds. You could then paint it with the included edible paints, it was quite tasty! So there you have it, my experience with TokyoTreat. I was very happy with what was included and if you are in the mood for authentic Japanese candy that you can’t get in the United States check out TokyoTreat today!